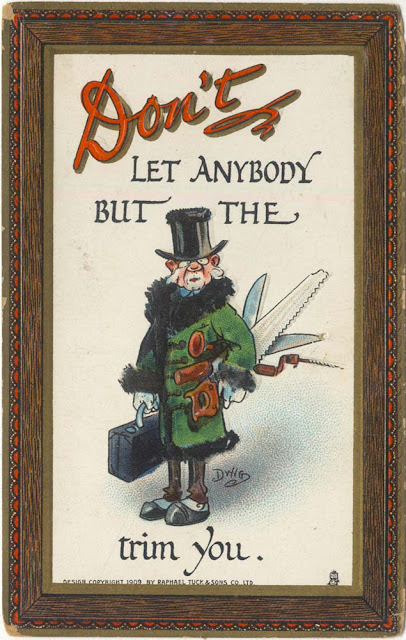 This Dwig postcard is from Tuck's Series #165, "Knocks Witty and Wise". There is lovely gold embossing on the frame of the card, which doesn't scan at all well unfortunately. I guess the fellow is meant to be a doctor, but his operating tools certainly don't inspire my confidence in his 'trimming' abilities. The Tuck cards were considered the Cadillac of post card publishers, or as they were British, the Rolls-Royce. They were always on a better grade of stock, printed in high quality colors and had a lithograph look to them. The embossed frame is a typical extra touch.